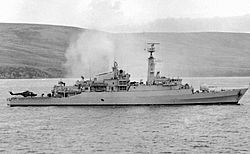 The Falklands War was a war between the United Kingdom and Argentina over the Falkland Islands in 1982. The Falkland Islands are 480 kilometres from Argentina in the southern Atlantic Ocean. Argentina and the United Kingdom have both argued over which country the Falklands Islands belongs to since the 1800s. In the 1760s and 1770s, the British set up a town at Port Egmont, which nearly led to a war with Spain who had a town at Port Louis. Then Argentina became a separate country from Spain in 1817 and set up a colony on the islands in 1820. An American warship later destroyed this town, and the British took the islands again in 1833. The British kept the islands until 2 April 1982, when Argentina invaded and occupied the Falkland Islands (and, the following day, South Georgia and the South Sandwich Islands) in an attempt to establish the sovereignty it had claimed over them. 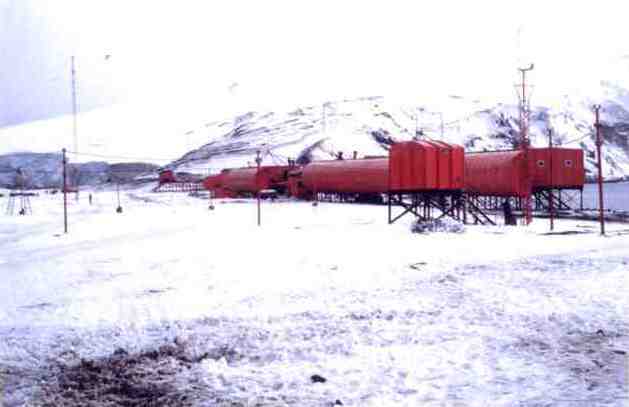 On 5 April, the British government dispatched a naval task force to engage the Argentine Navy and Air Force before making an amphibious assault on the islands. The United Nations Security Council asked Argentina to withdraw, and tried to end the crisis with diplomacy. After seven weeks, Argentina did not withdraw. The conflict was a major episode in the protracted confrontation over the territories' sovereignty. 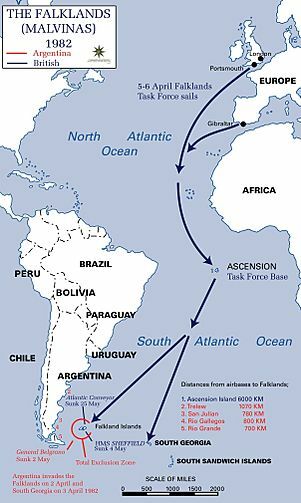 Argentina asserted (and maintains) that the islands are Argentine territory, and the Argentine government thus characterised its military action as the reclamation of its own territory. The British government regarded the action as an invasion of a territory that had been a Crown colony since 1841. Falkland Islanders, who have inhabited the islands since the early 19th century, are predominantly descendants of British settlers, and favour British sovereignty. Neither state officially declared war, although both governments declared the Islands a war zone. Hostilities were almost exclusively limited to the territories under dispute and the area of the South Atlantic where they lie. The conflict has had a strong effect in both countries and has been the subject of various books, articles, films, and songs. Patriotic sentiment ran high in Argentina, but the outcome prompted large protests against the ruling military government, hastening its downfall. The cultural and political effect of the conflict has been less in Britain than in Argentina, where it remains a common topic for discussion. Diplomatic relations between the United Kingdom and Argentina were restored in 1989 following a meeting in Madrid, at which the two governments issued a joint statement. In 1994, Argentina's claim to the territories was added to its constitution. Falklands War Facts for Kids. Kiddle Encyclopedia.